-User Interface not made for console. -Needed resources are hard to come by; doesn't feel random at times. Tired of those match-three games over flooding the market? Yeah, me too! Luckily for us Ironcast is far from that as there is tons of planning and strategy involved that the matching is the least of your worries. Being a fan of the original Puzzle Quest, this game caught my interest for the game play mechanic of using a puzzle board to gain stats and use them for attacks. However what I didn’t expect was the roguelite feature. Ironcast is set in an alternative Victorian history where people command these huge mechanical war machines called ‘Ironcasts’ to take out the British empire. 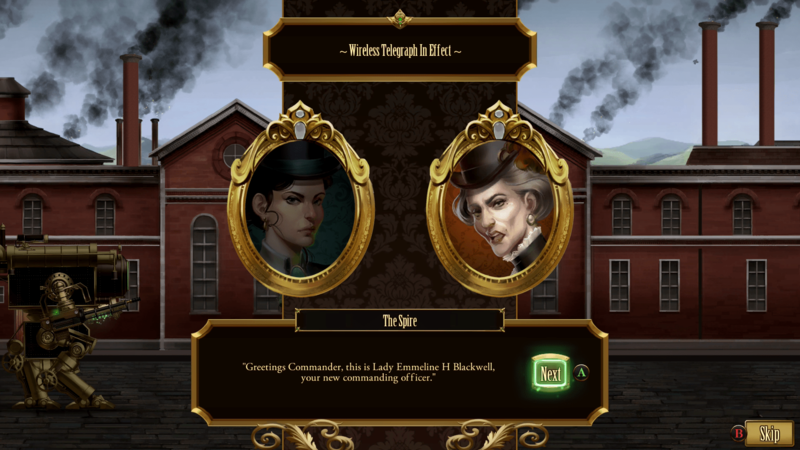 The goal of the game is to face off against enemy ironcasts to defend the 1880’s Victorian England. Although I felt there was no need for a story, it does add a lot of character for those who are interested. At the end of the day, all I’m doing is planning, attacking and making sure I beat the level to further progress my Ironcast. That being said however that doesn’t mean I don’t appreciate a story with my games, but for a puzzle game, it doesn’t have to be too in-depth. Strategy in attacking, and planning on defending, this is how I felt playing this game the entire time. 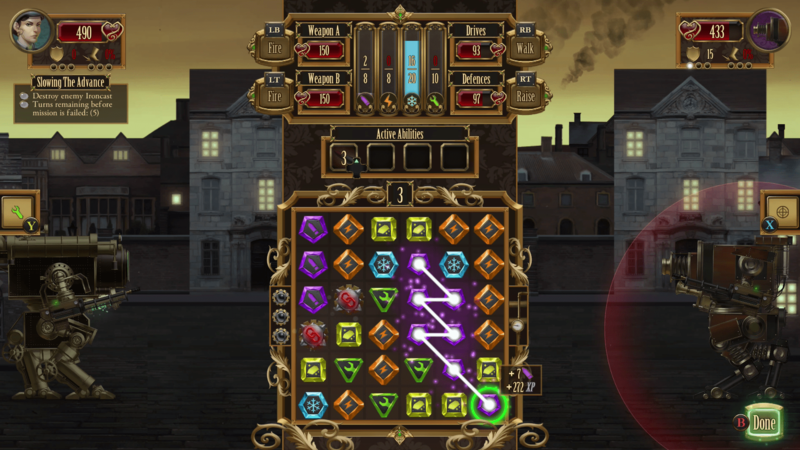 There is a 6×6 grid for you to match four main types of gems; Ammo (purple) which fill your ammunition for attacking. Power (orange) is used when making any type of attack and when enabling defenses or movement. Repair (green) is used to fix your weapons or defenses depending on what the enemy is aiming at. Coolant (blue) is used to prevent overheating. There are additional gems as well, from a Link, which allows you to chain together two different types of gems. There are also crates which have different uses depending on the missions; some may be to clear a weapon jam, another would be to collect a certain amount for the sake of a quest. Lastly we also have gold bars which serves as the currency for buying upgrades. The objective might seem to make the longest chain, this isn’t the case though. Sure you gain more experience in doing so, and there are some perks which give you bonuses for doing such but in theory each Ironcast has a specific amount of supplies they can carry, although each could be upgraded. The end goal is to simply destroy your enemies and keep upgrading. Unfortunately death is inevitable when first starting off, which in a way works out because the game plays as a roguelite. After death you’re given Commendation Marks. These marks are redeemed for permanent upgrades, new commanders, and Ironcats. There are a couple of features that didn’t seem to work well for console in comparison to the PC version. For starters, the menu has a cursor. A cursor….on a console game? I forget when was the last time I’ve seen something like this. Then we also have the problem of not knowing how much each move costs. I found myself in a panic not knowing if I should raise my defenses or start movement instead due to a lack of coolant. On PC when you hover over each of the commands it shows you its usage, which isn’t the case for console. This is really important as I need to figure out and plan each of my moves according to those uses so it is a pretty big issue. Eventually it comes down to just doing instead of worrying, and hope it all works for the best in the end. That being said I found myself making sure I have extra resources before making any moves, unless it came down to a life or death situation as if you lose all coolant, you start taking damage. Edit: After publishing this review, we were corrected in a feature easily missed during the tutorial/tips portion of the game. In order to see how much each move costs you have to hold the button. Although it isn’t as clear as it is on the PC version of the game, the feature is not missing just easily overlooked. Despite that issue, the game has great artwork and audio to compliment the gameplay well. The replayability is amazing as the rouguelite features make it so that even though you lose, you still gain different upgrades for your next turn. Ripstone provided DRULcast with a XBOX One review token. 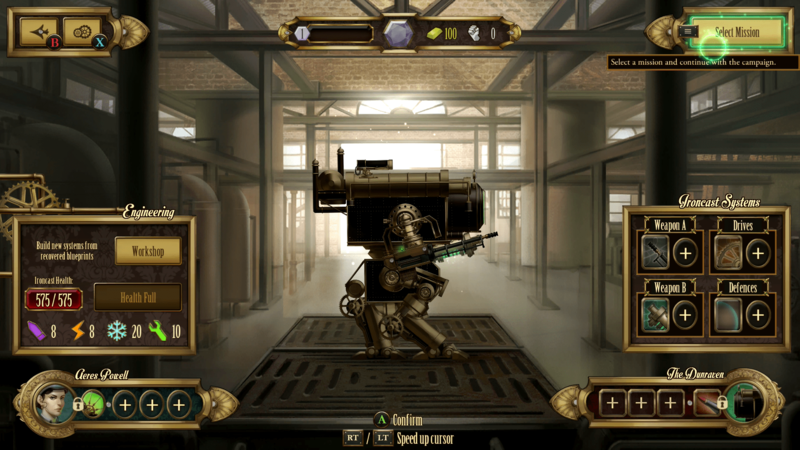 Ironcast is now available on Steam. Xbox One will release on March 4. Playstation 4 will release on March 1st & 2nd depending on region.